It is that time of the year and it is that time that you really need to go out and do some serious shopping because Christmas is coming and there are only six weeks left. Every year we say that we are not going to buy anything and every year at the end we have to buy at least a present for this or for that. 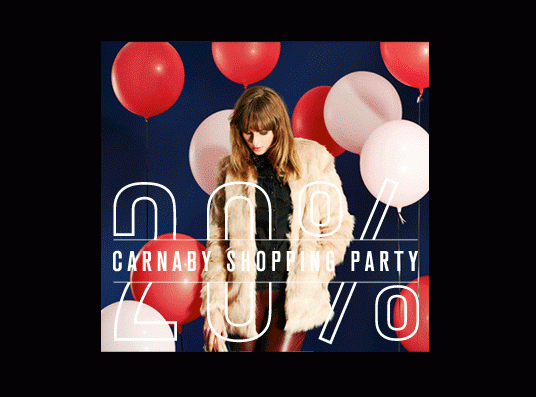 Carnaby Street Shopping Party helps you in finding the right pressie with a 20 % discount in shops participating in the event, and the shops are so many that the choice is endless. You can sort out your Christmas list in one night which is going to be the 13th of November from 5pm. Also it will be possible to win a fantastic goodie bag filled with treats. How to win it? Very easy, first of all dress to kill, at Carnaby Street they will be spotting somebody who is wearing something quirky, trendy, fantastic. The main accessory will be at least a shopping bag with your purchase from one of the stores participating in the 20% discount event. With these two must have requisites you are half way through to win a £ 200 worth of goodies stored in a beautiful Carnaby Street canvas bag. Check online for all the event on the night and to register for your free ticket at www.carnaby.co.uk and see you there.